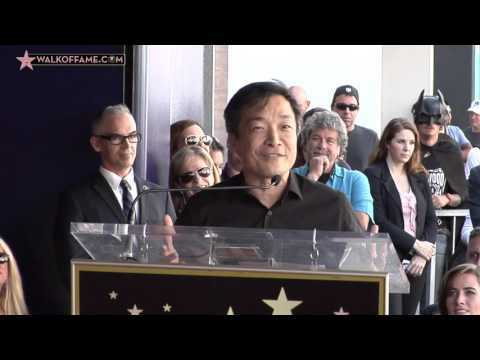 Watch the Walk of Fame star ceremony below. Helping emcee and Hollywood Chamber President/CEO Leron Gubler to unveil the star were filmmaker Zack Snyder and DC Entertainment Co-publisher and acclaimed artist Jim Lee. Snyder is at the helm of the upcoming action adventure Batman v Superman: Dawn of Justice due in theaters March 25, 2016, and will next direct the long-awaited Justice League feature film. Lee, who had the pleasure of meeting Bob Kane, will speak to the character’s enduring appeal and how Batman has captured the imagination of the entire world. In 1939 in a New York art studio, Bob Kane created one of the most popular characters of the twentieth century - The Batman. Kane’s creation has become the star of comic books, Saturday afternoon movie serials, newspaper comic strips, a live-action TV series, several animated TV series, and several of the largest-grossing feature films of all time. In 1939, one year after Superman’s debut, DC Comics editor Vincent Sullivan decided that he wanted another costumed hero. He asked 22-year-old Bob Kane for his ideas. “I went home that weekend,” Kane recalled, “traced some sketches of Superman, and started penciling different costume ideas. It was then that I got my first brainstorm: I remembered one of Leonardo da Vinci’s sketches - a drawing of a flying machine with bat wings. That’s what germinated the idea for Batman. The second influence on me was the hero with the dual identity in The Mark Of Zorro. And then I thought about ‘The Bat Whispers,’ a mystery movie written by Mary Roberts Rinehart. The first published appearance of The Bat-Man, as he was then known, was in the May 1939 issue of Detective Comics #27. Batman’s first adventure was called “The Case of the Chemical Syndicate,” and was written by Kane’s frequent collaborator, Bill Finger, who over the years would make many significant contributions to the Batman universe. The character was so successful that one year later the first comic book devoted exclusively to the popular caped crusader’s adventures, BATMAN #1, hit the newsstands. In that issue, Batman battled The Joker and Catwoman for the first time. Bob Kane continued to illustrate Batman’s comic book adventures until his retirement in 1968. His work covered not only countless comic book adventures, but also three years of the “Batman and Robin” newspaper comic strip, which ran from 1943 to 1946. The success of the Batman television show in 1966 brought Kane and his art back into the public eye. Kane was subsequently featured in various one-man art shows at galleries and museums nationwide. He served as a consultant on the 1989 Batman feature film and its three sequels. Kane’s autobiography, Batman And Me, was published in 1989. Seven years later, Kane was inducted into the Eisner Awards Hall of Fame in 1996. Bob Kane, the American cartoonist, died on November 3, 1998. Bob Kane was generous with his time and resources. He often visited children’s hospitals and donated funds to such organizations as Feed the Children, Make a Wish Foundation, the Westside Children’s Center, the Bay Area Youth Center and many other agencies providing services to the hungry, homeless, abused or abandoned children. The creative philanthropist donated a portion of proceeds from his one-man exhibit of original Batman oil paintings at the Carlton House’s Paul Stooshnoff Gallery to the American Cancer Fund. He also wrote and illustrated numerous comic strips, cartoons and comic books in tribute to Batman with all proceeds to benefit the Child Welfare League of America.